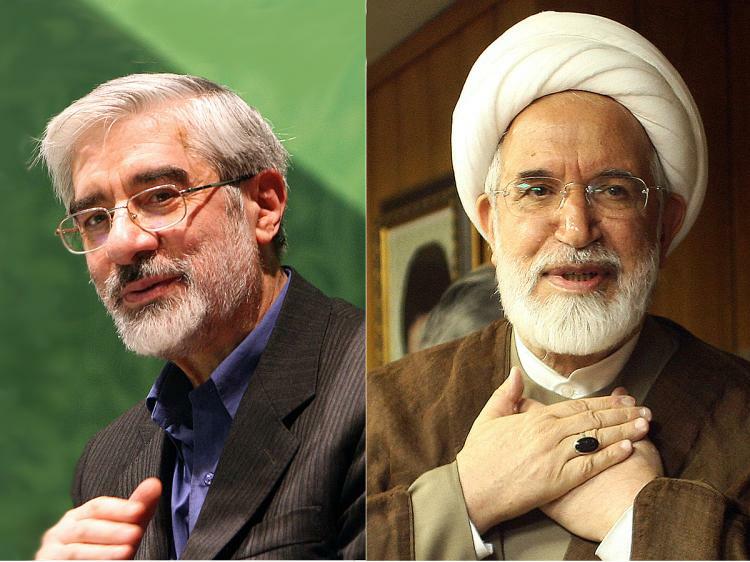 Mousavi and Karoubi were candidates in the 2009 presidential election. Ahmadinejad was declared the winner of the election. Opposition supporters claimed monumental vote fraud and massive street protests, largest in the history of the Islamic Republic, ensued. The opposition leaders demanded a recall. But the supreme leader, Ayatollah Ali Khamenei, dismissed the request and declared Ahmadinejad’s victory as valid. Mousavi and Karoubi has been under house arrest since. Think there will be more riots, this time around? Don't forget, results for every every polling station were released and no one from the opposition challenged the polling station results. That is to say, no Mousavi rep challenged the Form 22s, publicly provided. That Mousavi's claims were effectively debunked, he resorted to extolling his followers, mostly radicalized students, to rebel in the streets. However, Mousavi was later house-detained and order was restored. Obviously you can't have such a figure trying to run again in an election. He wouldn't win anyway. Better for the more liberal end of Iran's political spectrum to provide a different candidate, also. I'm hopeful polling stations will be established here in the U.S., like they were in 2009. The election is in 5 months? If there's a polling station here in northern California, I'll be voting again. I don't know why Nader is tolerating Mark on this blog. Radicalized students? The reports were pretty clear; it was a uprising by many different social groups. Mark sounds like he is part of the Iranian '50 cent group'. Deliberately spreading misinfo and lies. He already showed his lack of military knowledge, when he claimed that the Iron Dome systems were ineffective, because he didn't knew that the systems only focus on rockets that fall in urban areas. The elections (selections) aren't free; never have been anyway, and Mark's willingness to vote in these elections, only demonstrate his stance on these issues, in which he clearly supports non-democratic, mulah-organized elections. Think about it Nader; you have a snake on board. Yeah,you go and "vote" for some puppet of the mafia theocracy. No one buys that BS anymore from you or anyone else peddling on behalf of the occupying mafia Islamist regime. You're 101 percent correct about Mark.People like him have sustained this mullahcracy and claim to Westerners that the terrorists are reformable.These types of people are the ones that have handed Iran to the mullahs and their henchmen,then claim these gangsters are reformable. what the heck is wrong with you, Pyruz????? what kind of cretin contends that street demonstrations are riots... and pretends that the violence wasn't from the regime thugs??? what sort of liar says that those who question the honesty of the people running the government "obviously can't run for election"? He is a snake, probably paid by certain Iranian organizations, to spread disinformation, and by posting that he wants to vote in the next elections, he want to spread the image as if these elections will be free and democratic. Best way of promoting political dialogue is by challenging the viewpoints of others who differ or oppose our own viewpoints and offer our own narrative on the subject on hand. Mark Pyruz and those of you opposing his stand on Iran politics are no exception. Instead of character assassination, argue your case and show why in your view he is wrong. That’s the only civilized way I know to enter into any political debate. What Mark does in other blog is not the focus of my attention. In this blog, he has worked hardest to add quality content regarding Iran military developments, and has worked as hard to refresh the blog’s look and ease of use for its readers. He’s been an integral and important part of our team, even though he knew from the very beginning that my political views on Iran were at times diametrically opposed to his. Knowing that, and still accepting to contribute to this blog says a lot about his tolerant and democratic approach and the strength of his character. You don’t like his politics, fine, argue to win the day! I believe this time around, if there are any protest against the current regime during the elections, the US and other allies have the upper hand in helping the people of Iran with CHANGE. The Iranian government has taken a big hit on the chin with sanctions, the government within is broken and finally, no deal reached in Nuclear Talks. A perfect recipe for such event to take place. it's up to the people of Iran to oust these theocraps, not the US. In conjunction to your info that the Zionist pay to bloggers to spread their propaganda, I would like to ask - do they pay some people on this blog to spread Zionist propaganda too ??? So you guys no longer bet that there will be the war with Iran before elections ??? Believe me that the government is better prepared to eradicate any possibility or quash any elections disturbances than one of you can imagine. Even with those of your delusions you will see that the people of Iran don't want Western recipes for a blood and disorder as it is taking place in many countries exposed to Western hypocrisies. In old blog one can find like Mark and president Uskowi "dance" toogether in initiating discussion that "gently" ridicules Islamic Republic's system. Since Mark publishes Iranian military photolets, so it would be incompatiable if he would openly oppose to the Islamic Republic. Sometimes this blog has not enough opposing interlocutors...;someone even said that Mat has "changed" his views regarding "Zionist entity"...from the previous years? Many publications and organizations; run by the agencies, create .....fake indentities and personalities....in order to seduce unexperienced wanderers. becoming "Westernized' isn't the same as seeking autonomy rather than imposed policies and practices reflective of a blatantly small, inferior, and often ugly interpretation of a religion. Thank you allochtonie for your advice. You are right about him being a propagandist and cheerleader of the fascist Islamic theocracy. Thank god there are Iranians out there who have common sense like you. The problem with people like "Mark Pyruz" is that he is a propagandist for the regime,and with people like that you can't hold any debates as Uskowi claims. Because a propagandist job is only to spin lies on behalf of their masters,namely the IRI. So what is there to debate with someone who wants to throw you in the ditch all the time on behalf of the regime they work for? These type of people are very crafty and try to divert the reality of the situation in Iran to the regimes advantage. I can spot them a mile away! Mr Pyruz is correct in his statement. Also i do agree with the expressed view regarding Mousavi. Looking forward to the election. The former IRGC commander is a promising candidate. I would vote for him. A-F has become a spokesperson for the Iranian people. Tell me A-F,since when is it that you have decided what the Iranian people want? Everybody has an opinion,but don't try to be a spokesperson for the Iranian people. A-F what country do you reside in? I agree,the US,Russia,China,England,France should all stay away and stop their underhanded cooperation with the fascist theocracy,and let the Iranian people flush the theocraps away down the toilet.